This reference page extends the best practices covered in Scripting Strategies with greater detail on code libraries, labeling, and styling. We will be using Python to illustrate the concepts below, but the same principles would apply in Python and C#(Zerotouch) but in different syntax. Standard libraries are external to Dynamo and are present in the programming languages Python and C# (Zerotouch). 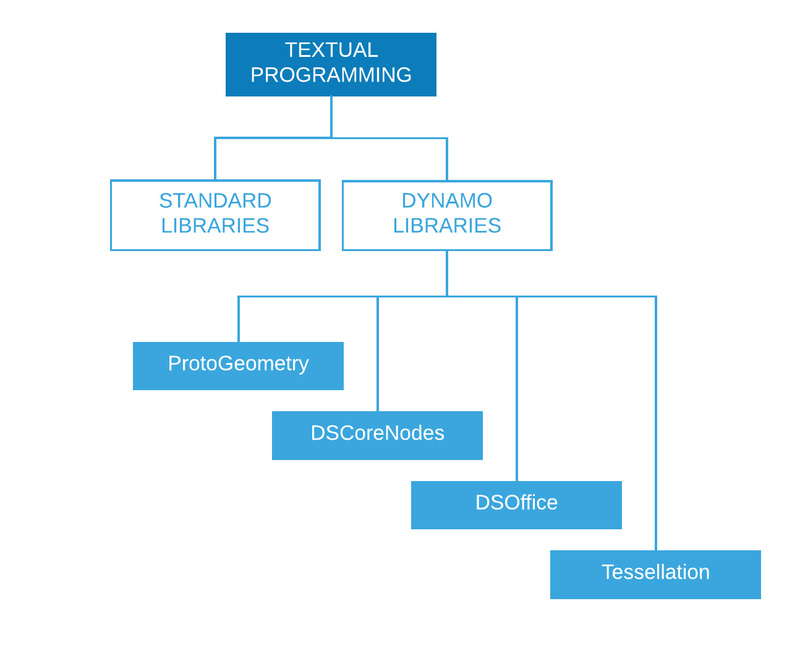 Dynamo also has its own set of libraries that directly correspond to it&apos;s node hierarchy, enabling the user to build anything in code that could be made with nodes and wires. The following is a guide for what each Dynamo library gives access to and when to use a standard one. Standard libraries from Python and C# can be used to build advanced data and flow structures in the Dynamo environment. Dynamo libraries directly correspond to the node hierarchy for creating geometry and other Dynamo objects. Functionality: Arc, Bounding Box, Circle, Cone, Coordinate System, Cuboid, Curve, Cylinder, Edge, Ellipse, Ellipse Arc ,Face, Geometry, Helix, Index Group, Line, Mesh, Nurbs Curve, Nurbs Surface, Plane, Point, Polygon, Rectangle, Solid, Sphere, Surface, Topology, TSpline, UV, Vector, Vertex. Note when using ProtoGeometry through Python or C#, you are creating unmanaged objects, which need have their memory managed manually - please see section below: Unmanaged Objects, for more info. Functionality: Color, Color Range 2D, Date Time, Time Span, IO, Formula, Logic, List, Math, Quadtree, String, Thread. Functionality: Convex Hull, Delaunay, Voronoi. It’s more sensible, in structural terms. Aliasing can quickly lead to very confusing and non-standard programs. Generally speaking there is more than one way to program just about anything, therefore your “personal style” of scripting is the result of the countless small decisions you choose to make (or not make) along the way. That said, the readability and maintainability of your code is a direct result of its internal consistency as well as its adherence to general stylistic conventions. As a rule of thumb, code that looks the same in two places should work the same, too. Here are a few tips for writing clear and consistent code. Tip: Avoid one-letter variables (esp. l, O, I) except in very short blocks, when the meaning is clearly visible from the immediate context. Extra blank lines may be used (sparingly) to separate groups of related functions. Don&apos;t stress over it ~ 79 characters. Sometimes fewer comments makes for more readable code. Especially if it forces you to use meaningful symbol names instead. Tip: Comments tell you why, Code tells you how. Open Source projects are built on the collaborative efforts of many developers. These projects need to maintain a high level of code readability so that the team can work together as efficiently as possible. Therefore, it is a good idea to browse through the source code of these projects to observe what these developers are doing. Question whether or not each convention is working for the needs at hand. When using Dynamo&apos;s Geometry library (ProtoGeometry) from Python or C# geometry objects that you create will not be managed by the virtual machine, and the memory of many of these objects will need to be cleaned up manually. To cleanup native or unmanaged objects you can use the Dispose method or the using keyword. See this wiki entry for an overview: https://github.com/DynamoDS/Dynamo/wiki/Zero-Touch-Plugin-Development#dispose--using-statement. You only need to dispose unmanaged resources that you don&apos;t return into the graph or store a reference to. For the rest of this section, we&apos;ll refer to these objects as intermediate geometry. You can see an example of this class of object in the code example below. This zero touch C# function singleCube returns a single cube, but creates 10000 extra cubes during its execution. We can pretend this other geometry was used as some intermediate construction geometry. This zero touch function will most likely crash Dynamo. Since we created 10000 solids, but only stored one of them, and only returned that one. We should instead, dispose all of our intermediate cubes, except the one that we return. We don&apos;t want to dipose what we return, as it will be propogated into the graph and used by other nodes. In general you only need to dispose geometry like Surfaces, Curves, and Solids. To be safe though, you can dispose all geometry types (Vectors, Points, CoordinateSystems).